Mmmhhhh Elon Musk il "geniale" inventore della Tesla ricorda un pò Steve Jobs (o Tony Stark?!?) in quanto a volontà di cambiare il mondo. Per il momento però la nuova D offre alcune feature sulla sicurezza molto interessanti (leggi i segnali di riduzione della velocità o cambio corsia) ma niente di trascendentale. The Tesla "D" that Elon Musk so provocatively tweeted about last week is actually an all-wheel-drive version of the Model S Sedan. There will be three versions, and each will carry the "D" designation, to distinguish them from the rear-wheel-drive Model S.
AWD will be a plus for Tesla's customers in the Northeast and in Northern Europe, to deal with bad weather. 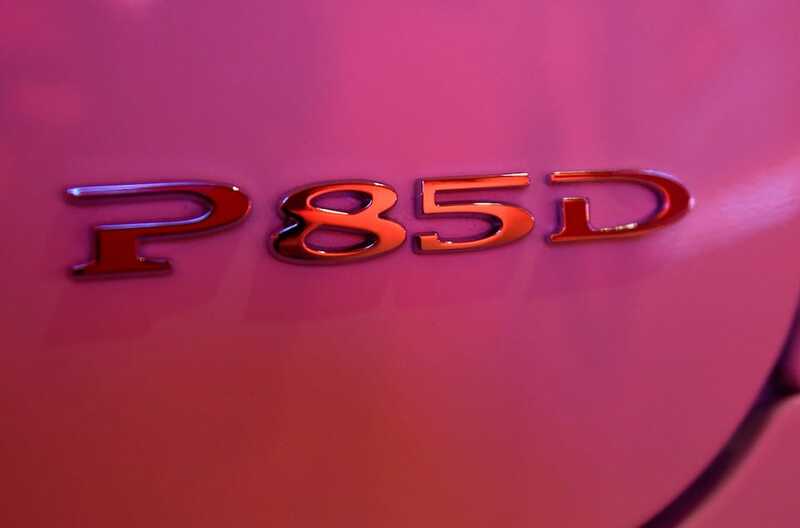 The current performance version of the Model S — the P85 — will become the P85D and be capable of 0-60 mph in a blistering 3.2 seconds. That acceleration is right up there with supercars from Ferrari, Porsche, and Mercedes. 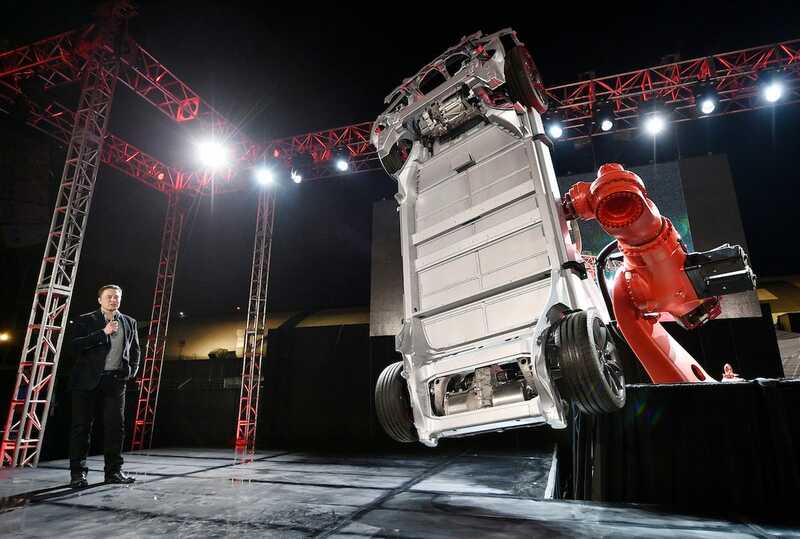 In addition to the "D" — and to be truthful, many Tesla observers speculated it was going to be all-wheel-drive — Tesla is introducing a cluster of driver-assist features. These include things like the car being able to read speed-limit signs and adjust its velocity, signals that make the car change lanes, and some familiar stuff, like lane-departure warnings. Kevork Djansezian/Getty ImagesThe D has dual motors — one for each set of wheels. Kevork Djansezian/Getty ImagesIt will do 0-60 in 3.2 seconds. 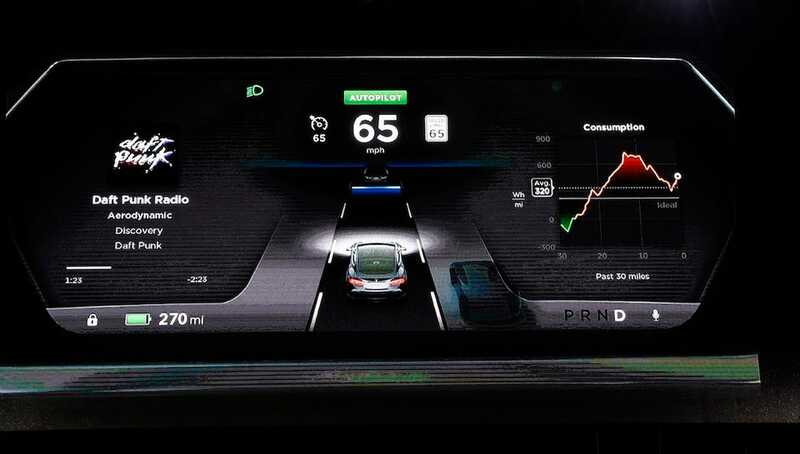 Kevork Djansezian/Getty ImagesThe new Tesla instrument panel, now with autopilot features. Kevork Djansezian/Getty ImagesEverybody loved the robot arm. 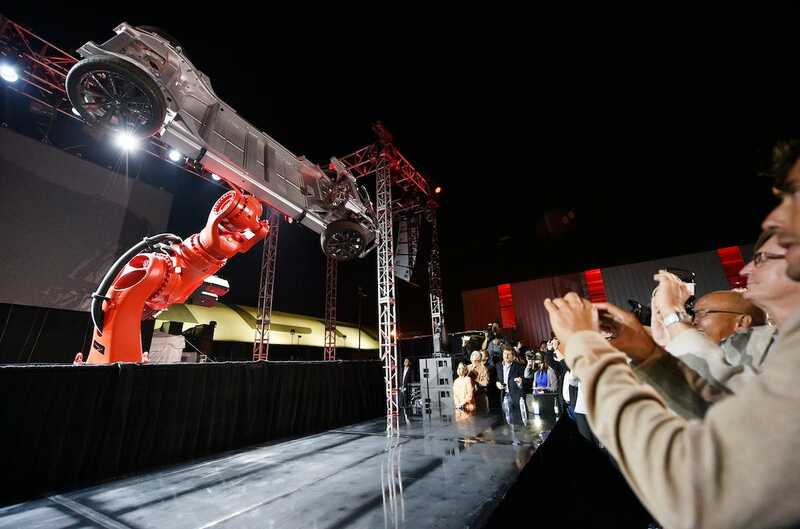 Kevork Djansezian/Getty ImagesThe robot arm was an amazing pierce of showmanship. 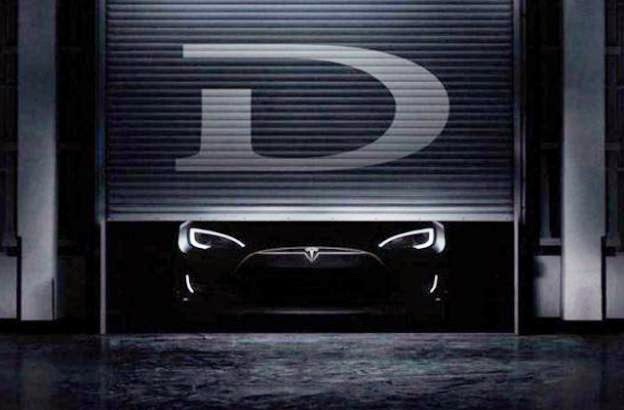 At USA Today, Chris Woodyard is reporting, ahead of the offical Elon Musk reveal, that the "D" is a very fast version of the Tesla Model S sedan, with all-wheel-drive. 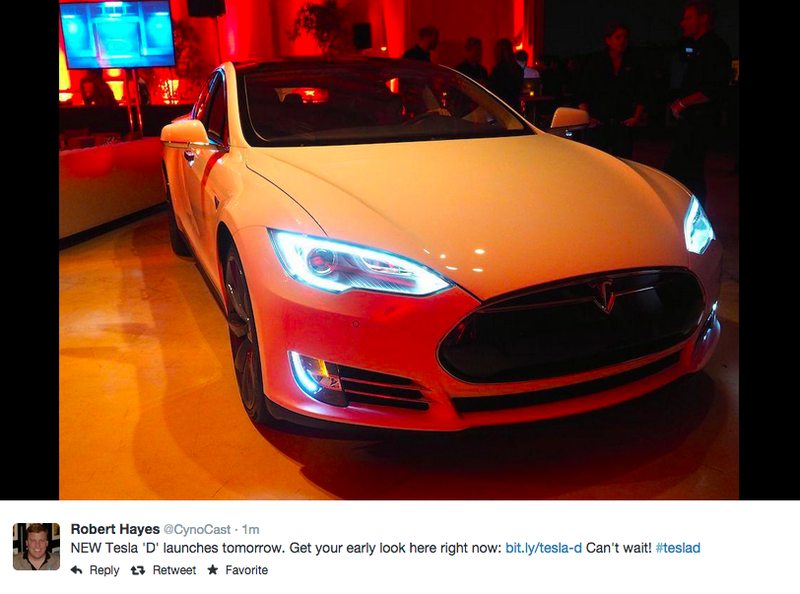 Other new information: Tesla will offer a "suite of driver aid and safety features." Evidently, Tesla's will be able to "read" speed limit signs and adjust speed accordingly! If Woodyard is right — and he has quotes from Elon Musk, so it looks like he had an inside track — then "D" will disappoint those who were expecting a almost fully autonomous self-driving Tesla. 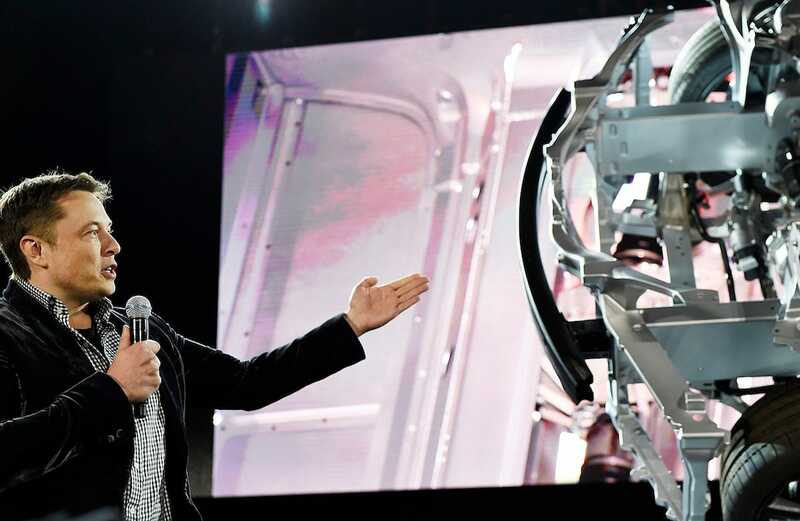 The news is out, but our man at Tesla's event has a photo of a stage where the "D" will be revealed. According to USA Today, the "D" will be a Model S sedan that has marginally increased range, dual motors (as expected, one for each pair of wheels) to supply all-wheel-drive. There will be three versions, each with a different size battery. The AWD performance version of the Model S — the PS85D — will be able to do 0-60 in just over 3 seconds. That's blistering. The "something else" that Musk tweeted about last week is a cluster of safety and advanced cruise control features. Teslas will now be able to "read" the speed on speed-limit signs and adjust themselves. They will also have a lane-departure-warning system. Turn signals will be able to move the car over one lane. Engadget tweeted this shot, which is getting retweeted now. It's an all-wheel-drive Model S P85D. 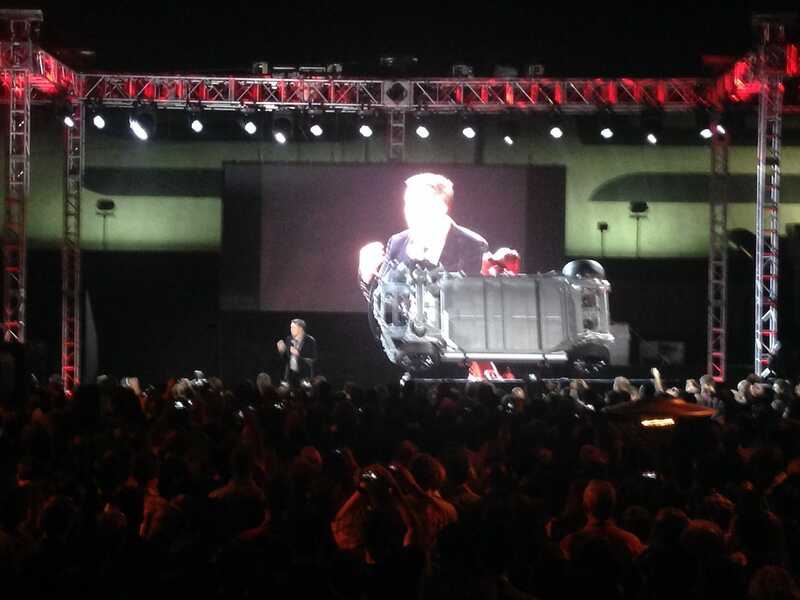 Elon Musk takes to the stage! 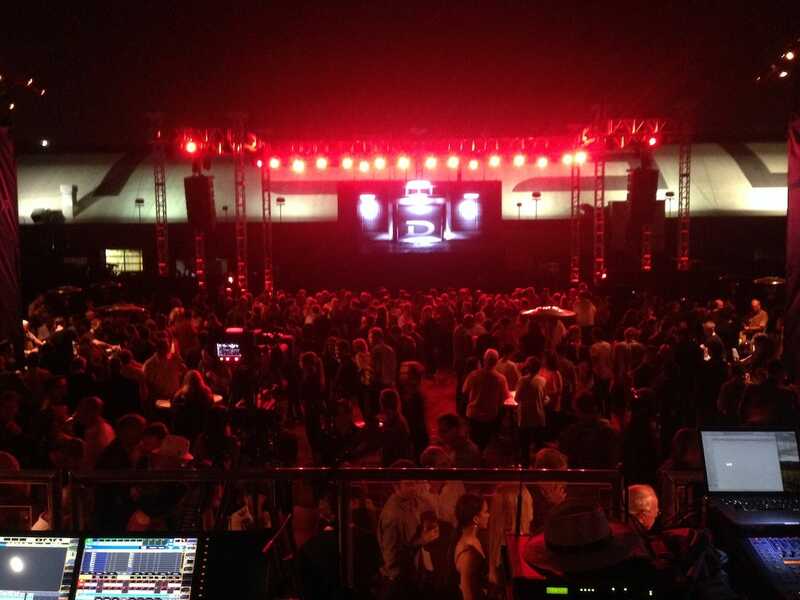 Tesla CEO Elon Musk is live in L.A. at the Tesla D event. 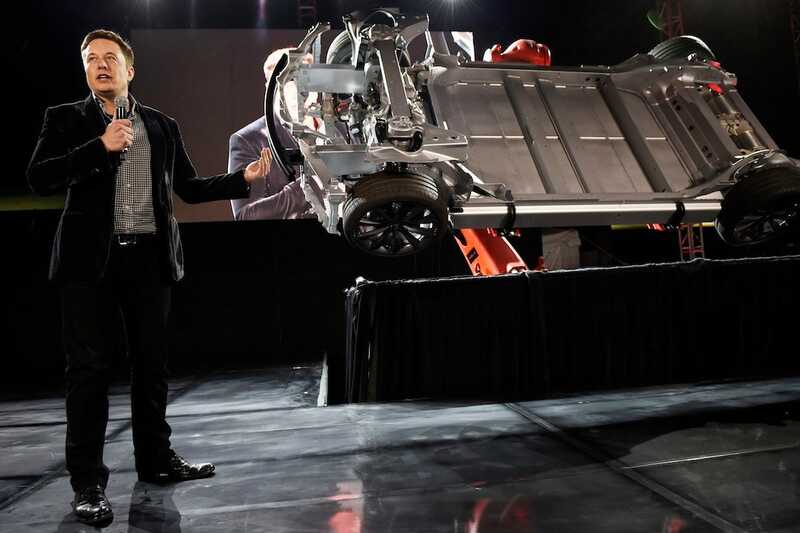 It looks like he's got a ROTATING Model S "D" that he can use to show off the all-wheel-drive technology. Musk says that the Model S P85D will have three different driver settings: Normal, Sport, and Insane! Zero-60 in 3.2 seconds — in a 4-door! — is pretty nuts. The Roadster Sport, for comparison's sake, did 0-60 in 3.7 seconds and that was very, very fast. Now at the "D" event Musk is making a robot arm holding the Model D do some cool stuff. Not unlike Tony Stark/Iron Man with his little clan of robot assistants. Deliveries of the Model S P85D will start in December, according to Tesla. Thinking about asking Santa for an all-electric supercar? The Tesla event is pretty much over but for the partying. We now await Elon Musk's next earthshaking tweet.